Ho-Hum Walkway OR Rockstar Runway? We’re super excited about this little project because it combines all the elements we adore…….Stencils, Spray Paint, and something we already own – Sidewalk! 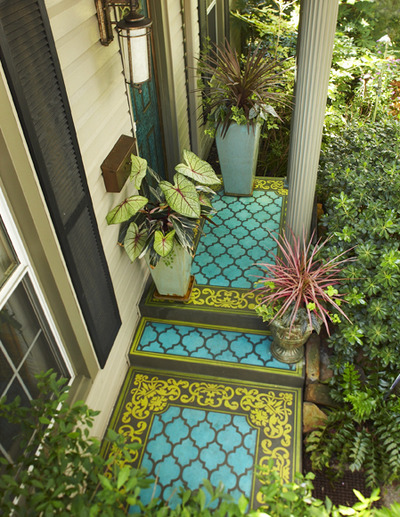 Ready to make your walk way look like a runway? Then grab your goodies and Lets Do The DIY Thang! First, grab yourself some totally killer stencils, then peruse a few amazing colors of the spray paint rainbow , not forgetting the primer, (unless you want it to slowly wash off within a span of 6days to 6 mths), a pair of rubber gloves and a face mask. Oh and trust us on the last 2, they’re just as important as the rest of the items. No one wants to ruin a manicure when they dont have to and ‘huffing’ may seem like fun but it’s 100% not. Make sure your canvas is as free from excess dirt and residue as possible and that it’s dry. Then pick your pattern, lay flat on the desired area you wish to “fabulize” and while keeping the can atleast 8-10 inches from the surface, spray in a slow left to right motion. No Mr. Miyagi style folks, we’ll save that for another project. Wait a minimum of 10-15mins before applying another coat or moving your stencil to ensure that it’s fully dry. After you’ve reached your desired level of opaqueness, move your pattern onward and upward. (and “…to Narnia and the North!” for all you CS Lewis fans). Once your amazing DIY piece is finished you can toss up some twinkle lights and invite everyone over for a ‘walk-off’ on your new fabulous runway! Catfights and Negative Triple Zero sizes NOT INCLUDED NECESSARY. Previous post you can do anything….